Gua Sha Tool: Our favorite is the Empress Stone by Wildling, but a Generic H shaped rose quartz tool is what is used in the videos because they were shot before Wildling launched. A tool that you already have will work as well, simply line up the edges and points in a similar fashion to what is shown in the videos. The primary focus here is really on correct technique, appropriate speed, and offering you a full practice video that you can follow along with stroke by stroke, to support and optimize your ritual at home, so you can truly enjoy all the benefits that Gua Sha has to offer! Stone Roller: We suggest the Amethyst Roller By Jade Roller Beauty. Amethyst has benefits for reducing redness and inflammation in the skin, which is great for acne prone skin. Hydrosol and Oil: Wildling has created the perfect formula for Gua Sha. We suggest the Empress Tonic and Empress Oil. Please note that for the Clear Sequence, the oil is only required for slip on the neck and shoulders, since the stone roller that we use on the face portion glides just fine without oil! The budget friendly alternative is Organic Jojoba oil from Desert Essence on Amazon.com. But any cleanser you are already using can work, as long as it makes your skin happy! Gua Sha should not be practiced on areas of the face that have received any injections such as Botox, fillers, or anything else within the last three months. It is also not appropriate over an open wound, active break out, inflamed or irritated skin. For any other concerns, please consult with your healthcare provider before starting a Gua Sha practice. Familiarize yourself with the regions we will be working on, and learn to create a baseline. 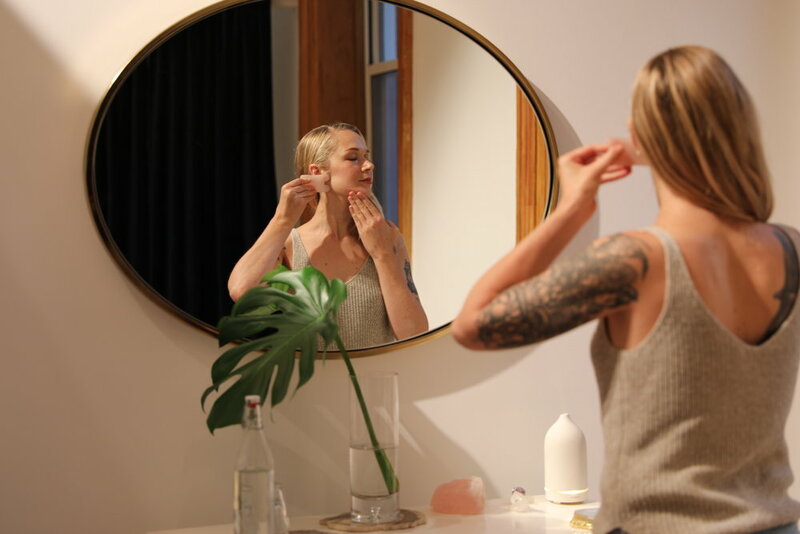 Notice the texture and firmness of your skin, the level of muscle tension, and overall feeling of your face before and after each Gua Sha practice. For the Clear sequence, we are using the Gua Sha Tool over the neck only. For the face, we are using the extra gentle stone roller. Stick with the clear practice as long as there are active breakouts on the face. Only move on to the classic practice where you glide the Gua Sha tool on the face once skin is clear and calm. Practice this sequence every day as you are learning the technique. Once you are comfortable, you can transition to a twice a week practice. *To satisfy the requests of our followers, we shot these tutorials before Wildling launched with a generic H Shaped Rose Quartz Gua Sha Tool, which is also suitable to use. These videos have no expiration, but will be taken down and replaced when we launch the videos with the Empress Stone. Beauty. Wellness Tutorials. Events. Straight to your Inbox.